Ram temple profits politicians, not ordinary people, say Ayodhya residents. Twenty six years after Hindutva mobs demolished the mosque in their town, Ayodhya’s residents have mixed feelings about the proposed Ram temple. 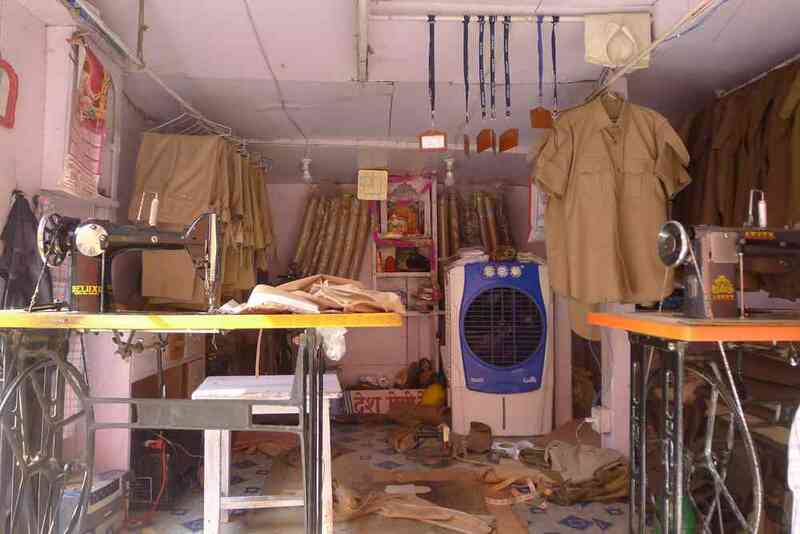 On the outer periphery of the site on which the Babri Masjid used to stand, alongside a police barrier, Rajitram Maurya and his younger brother, sew police uniforms in the tailoring shop that they run out of a wooden kiosk. As a boy, Maurya, who is also a Home Guard, had wandered in the fruit orchards around the Babri Masjid in the Uttar Pradesh town of Ayodhya with his siblings and friends. But when his own children had to walk across the same land on their way to school, they needed a pass to clear the police posts on the way. Twenty six years ago, on December 6, 1992, Maurya was on duty near the Babri Masjid, and described what he did: “I was sitting down like everyone else, my gun was lying in front of me. No one did anything. We just watched the BJP people come and destroy”. 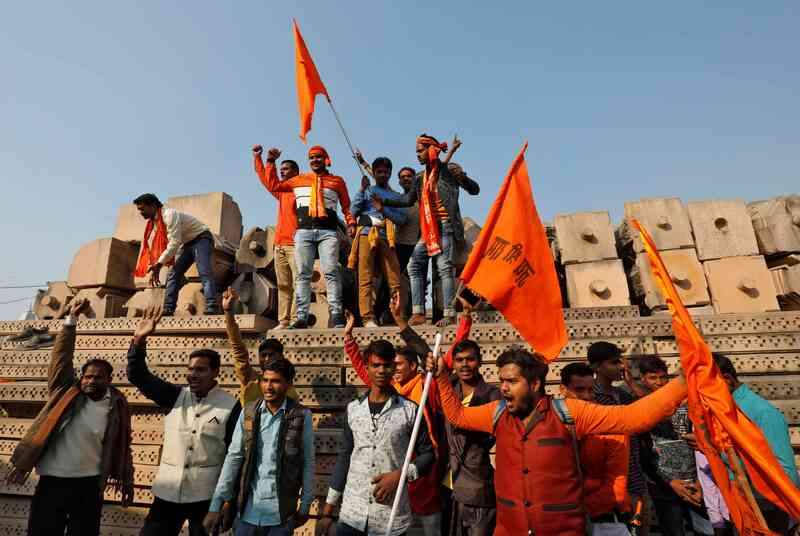 Led by senior members of the Bharatiya Janata Party, thousands of Hindutva supporters stormed the 400-year-old mosque that morning, claiming it had been built on the exact spot on which the god Ram had been born. In a few hours, they demolished it. The BJP, in its manifesto for the 2014 election, has promised to build a Ram temple on the site. The police uniforms Maurya and his brother were sewing were as a consequence of 1992, he said with a smile. Their reputation has grown through word of mouth and they get steady work from the large numbers of police and paramilitary deployed in the town. Before 1992 the family grew flowers on two acres of land. “All the malis of Ayodhya used to take their flowers from here – marigolds, jasmines, roses…” The government acquired one acre of their land for the Ram Janmabhoomi site, paying them a paltry Rs 60,000. The other acre was sold to Gokul Bhavan, the big temple across from their shop for the same price. In 1990, before the mosque was demolished, his cousin Vineet Kumar Maurya had worked as wage labour to clear and level the land around the site, after the government demolished the numerous small temples that stood there. Vineet Maurya is hoping to shake up the town and the temple movement. 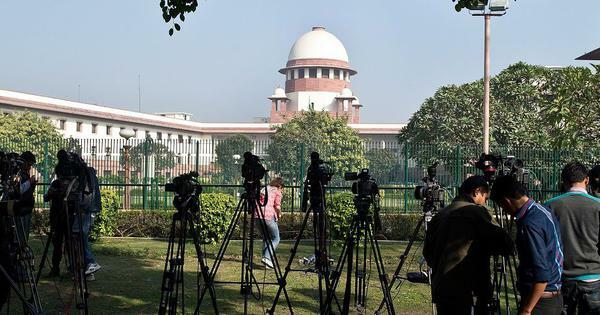 A Dalit activist, he filed a plea in the Supreme Court in July to have Ayodhya declared a Buddhist site, based on reports of the Archeological survey of India. A hearing, along side several other pleas, is set for early next year. In the Maurya Panchayat mandir, which like many other temples in Ayodhya doubles as a student hostel, Vineet Maurya succeeded in getting a majority vote in favour of removing the Brahmin priest who performed all the pujas and other rituals. Ayodhya has temples built by many caste groups from around the country but, Vineet Maurya said, the priests are still all Brahmin. Ideally he would like the Maurya mandir, where the presiding deities are Rama and Sita, to venerate Buddha. 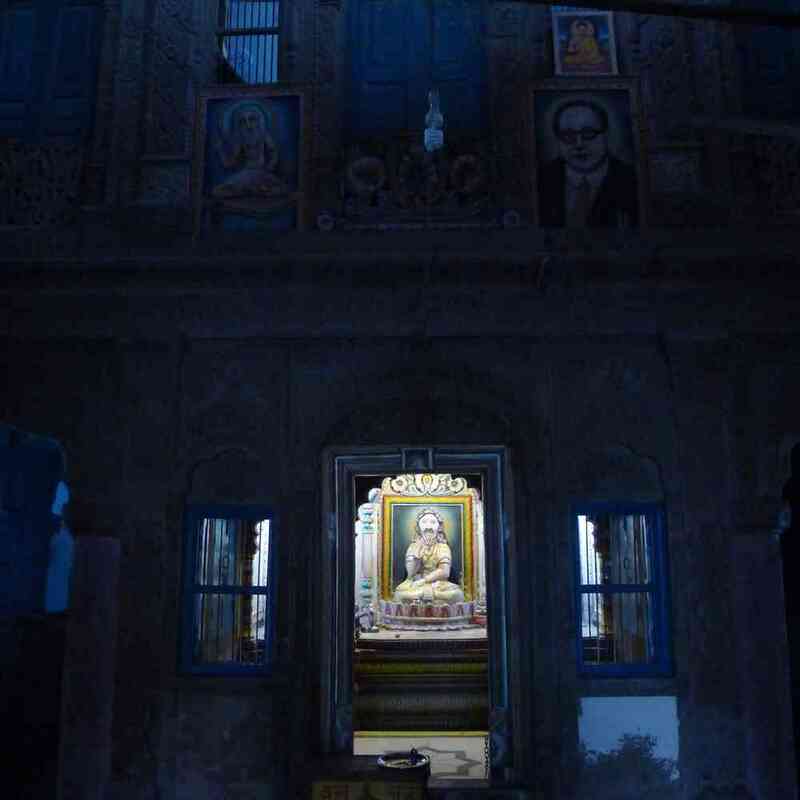 The town has two prominent Sikh gurdwaras, many Jain temples, while many of the Hindu temples feature a two-fish motif, marking their link with the Awadh Nawabs. There are mosques that serve the small Muslim community and myriad dargahs that are attended by both Muslims and Hindus, who form the vast majority in Ayodhya’s population. 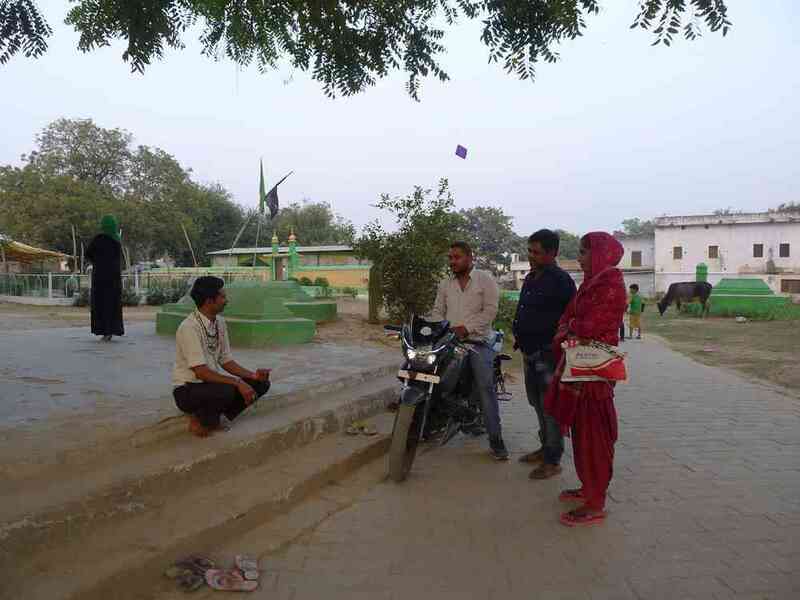 At the Naugazia peer’s dargah, Gyandeep Trivedi, who drives a tempo, can be found every day after 4 pm, sweeping the platforms and chatting to regulars. As for Christians, in the late 19th century Baptist and Wesleyan missionaries preached their gospel unmolested during the annual Ram Navami Mela, collecting crowds mostly of the curious, among whom they found the occasional seeker. Ayodhya was by nature a placid place, Garg said, and it worked in its own slow way. “When a tempest comes from outside, things are disturbed for a while and then they return to normal,” he said. 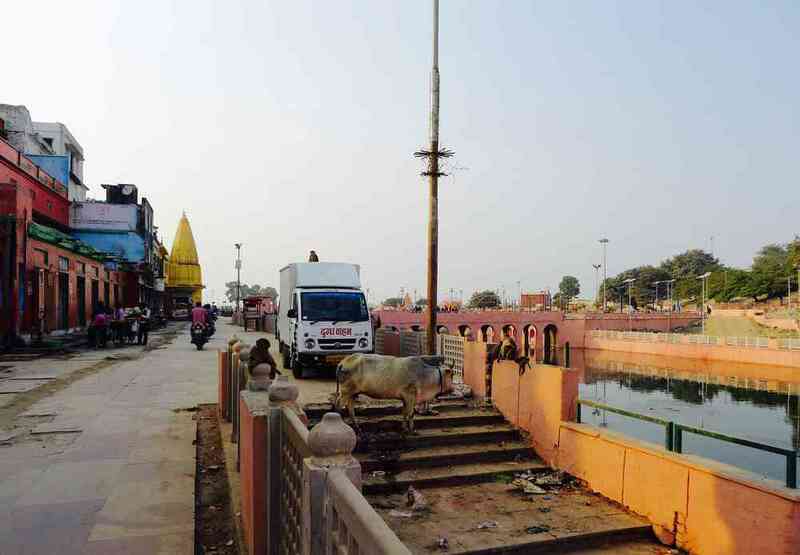 The tempest that Garg spoke of was not whipped up by Vineet Maurya trying to unseat Ram in the Maurya Panchayat temple, but by the Sangh Parivar and other Hindutva organisations using Ayodhya as a stage from which to talk up the Ram Temple issue. Following the events of 1992, when Ayodhya’s residents did for a time believe a big new temple might be the route to economic salvation, the subject has mostly receded from everyday conversations. “It is only when we have visitors and they bring it up that there might be a discussion,” said Priyanka Yadav, a trainee school teacher. 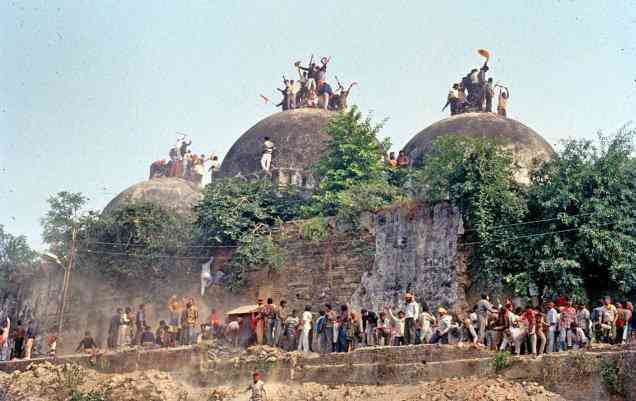 It was also only when there were visitors from outside that most Ayodhya residents interviewed said they went to the makeshift temple at the Babri Masjid-Ramjanmabhoomi site. Kanak Bhawan, the 19th-century Ram temple built by the Raja of Orcha is the most prominent Ram temple in the town. But it is Hanuman Garhi that draws the largest number of devotees. A few days earlier, Ayodhya had been in an all too familiar lock-down mode, awaiting the tempest from outside. The Shiv Sena and the Vishwa Hindu Parishad were in town at the end of November to rake up the Ram temple issue again. More police and security forces were deployed, more road barriers and check posts set up. Most shops were shut, Muslim families living on the main streets locked up and left town, schools were closed, some were turned into camps for the additional security personnel deployed in the town. With the media drumming up expectation of a major announcement there was a sense of foreboding – what if there was a repeat of 1992. For most of Ayodhya’s ordinary residents of all religions, economic life has always revolved around three annual religious festivals or melas that can bring in upwards of 20 lakhs of pilgrims. Ayodhya’s population stands at a little over 55,000. The last mela of the year was in mid-November. The fear that something might disrupt this calendar weighs heavily on the town. Bagelu Prasad Soni, who has run a jewelry business in the main market since 1980, said after the 1992 movement it took years to draw pilgrims back to Ayodhya’s melas. People were afraid to come. Soni, a former Shiv Sena member who claimed he was among those who planned the demolition, quit the organisation when his own business went down hill after the demolition. Its never quite picked up again, he said. He laughed hollowly, the Ram temple is bad for business. The disruption only profits politicians, not Ayodhya or its residents, said Soni, who professes to still support the Sena. Vishal Kumar Gaur was about 18 in 1992. He said he was one of a group of 10-12 friends who were among the many men who, armed with rods and shovels helped demolish the Babri Masjid. 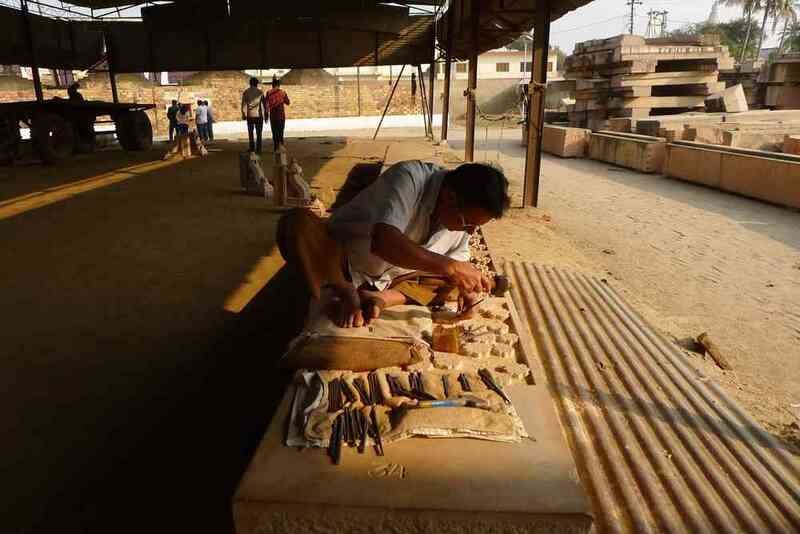 They had not wanted to demolish it, he said, sitting at his desk in the Craft Museum in the Tulsi Smarak Bhavan. They had just wanted to “break the gumbad [domes] and replace them with shikhar [spires]”. A Ram temple, said Gaur, “is not as important to Ayodhya as Hanuman Garhi or Kanak Bhavan, and it never was. I remember that the kirtan at the chabutra [before the demolition] would get started only when they spotted a visitor, and they never had many visitors, except during the melas.” The land around the site – 68 acres – was wasted, he said. The town needs a college, a women’s hospital (the maternity wards in the public hospital are non-functional. “We don’t need such a large temple, money and lives will be wasted building it,” he said. Echoing many interviewed for this report, Gaur said that the Ram temple issue deflected attention from Ayodhya’s problems and trapped its people in a web of politics created by forces outside their control. Much has been made of the improvements in Ayodhya focusing on civil works done in the town. A pucca road for the parikrama route when the Bahujan Samaj Party was in power, a sewage system when the Samajwadi Party was in power, underground cables and heritage street light for the main thoroughfare since the BJP formed government. But Dhamendra Singh, economics lecturer at Saket college and a former office bearer of the district unit of the Akhil Bharatiya Vidhyarti Parishad, the BJP’s student associate, said that these were just the basics that governments were expected to deliver. Besides, the authorities had done nothing yet to provide toilets during the melas, he said. Pilgrims still defecated in the open gutters and on streets for want of options. The really big problem was that there were no jobs, save those that serviced the temple economy. Another temple was not going to change that. The most steady work in the town was making or selling sweets that are offered at the temples, or flowers garlands, and for temple guides – who, apart from what they are paid by pilgrims or tourists, get a commission from temples. At the towns oldest and best regarded high school – Mahrajah Inter College – teachers confirmed this, saying their best students leave, the rest if they are lucky get to make ladoos. Brij Kumar Gupta, the last person to be elected president of the Ayodhya Traders Association, said that most of town’s economy was “kamao-khao”or “earn-eat”. It simply did not allow for saving and hence for investment either in business or in education or training. It was just not possible for a man selling small items essential for a puja to start a business selling TVs or even start a small eatery. He would not have the capital. As most shopkeepers were tenants of rich temples which own most of the property, there was no question of getting loans from banks. Nitin Kumar, whose small sari business runs from the same shop that his father used as a photographer’s studio and from where his band master grandfather managed his group of musicians, says that zamindari is alive and well in Ayodhya. Tenants have no rights and landlords are loath to allow them to do repairs or even build toilets. The flipside of this is that shopkeepers pay old rents, without which their small turn over seasonal businesses might not be even “kamao-khao”. The more prosperous businessmen are the ones who have several shops or contracts to supply the temples. It is the temples that everyone selling anything of value looks to for custom. Temples and the mahants who control them, everyone agrees, are the Ayodhya’s wealthiest people in town and also the recipients of the biggest largesse. A couple of kilometers from the centre of Ayodhya is the Sangh Parivar compound, the Vishwa Hindu Parishad-owned Karsewakpuram, that until the early 2000s was often mistaken for another locus of power in the town. It is now a desolate place, and its temple that houses the model of its proposed temple, rarely has visitors. At its workshop, carved pillars and beams lie piled up on all sides – an entire floor’s worth, according to the lone stone mason working there. As he chipped away at a block of stone, he said, if there were more workmen the work would be finished in no time. But with no fix on whether a temple will be built and what the role of the Vishwa Hindu Parishad might be, giving the impression of temple building activity seems to be the focus. The workshop does get visitors – mostly small groups from out of state, accompanied by a guide who works on commission. Hanuman Yadav the caretaker confirmed that no one from Ayodhya ever comes there. Derisively he said, “They have no interest in the temple”. 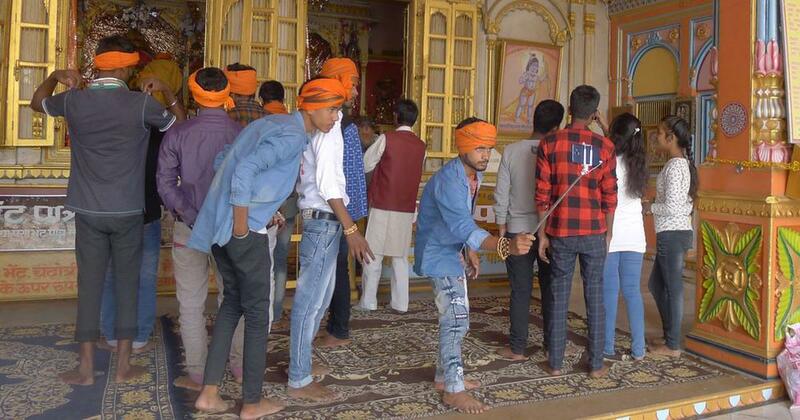 Sangh loyalists in Ayodhya, as elsewhere, however, don’t see it quite like this. They still hold out hope that Prime Minister Narendra Modi will deliver them a temple. Among them is Madan Tiwari, who in 2002 had recited a narrative poem he had written to this reporter, describing the excitement that the Ramjanmabhoomi movement had created in Ayodhya and the disappointment, even dejection, on discovering that it was simply a political campaign with an election in sight. Tiwari, side stepped questions about that poem, saying he had written too many to remember. A religious preacher, Rambhadrachari of Chitrakoot, had convinced him to place his faith in Modi. Tiwari also slipped this reporter a DVD with video footage of the destruction of the Babri Masjid, among other things. A booklet with photos of the demolition and a viewmaster with the same images were popular souvenirs until the early 2000s. The Samajwadi Party government of Mulayam Singh had banned their sale on the grounds that they incited communal hatred. But recently, new stocks of DVDs had arrived in Ayodhya, and Tiwari said that though he may not be able to sell them, he could share them for free. He hoped that young people who were unfamiliar with 1992 would be inspired by the video clips of the demolition. Teachers at Maharaja Inter College fear just this sort of thing. But there is just the possibility that the likes of Tiwari will have to contend with likes of Vineet Maurya who are challenging residents to question their own certainties and even their gods, and also the likes of Nitin Kumar – the grandson of the band master, who said having wasted his own youth as a foot soldier of the temple movement, he tells his children not to get caught up in such things and to focus on education and finding jobs.